Surf the free Wi-Fi swim in the outdoor pool and enjoy the convenience of in-room microwaves and refrigerators at the Econo Lodge Thomaston. The two-story hotel's 32 exterior-corridor rooms all have free Wi-Fi cable TVs microwaves mini-fridges and coffeemakers. The hotel has a continental breakfast where guests can get in a quick bite before heading out for the day. In the afternoon wind down in the seasonal outdoor pool. Pets are allowed for a fee. The hotel is on U.S. 19 about three miles from central Thomaston. Several restaurants are within a five-minute walk. Franklin Roosevelt State Park and the Little White House Roosevelt's Georgia retreat are within 40 miles of the hotel. Go hiking and fishing at Sprewell Bluff State Park on the Flint River about 18 miles away. Hartsfield-Jackson Atlanta International Airport is about 55 miles away. 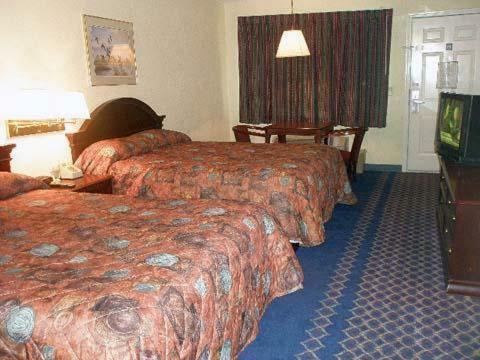 Add Econo Lodge Thomaston to your free online travel itinerary.